I just learned that Elaine Morgan died on July 12 at age 92. Morgan, as some of you may recall from my earlier post, was the leading purveyor of the scientifically discredited Aquatic Ape Theory of human evolution. Based on that association alone, it would be easy to dismiss Morgan as a wholly likeable but misguided crackpot — a housewife who was in over her head scientifically. But that would be an injustice to a smart insightful woman who would serve as a role model and inspiration to a generation of women after the publication of her 1972 book, The Descent of Woman. 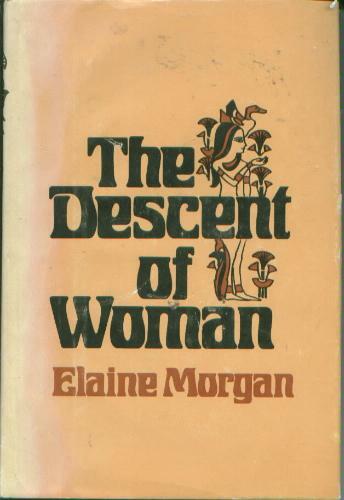 Morgan wrote Descent as a direct challenge to the prevailing evolutionary theories of the time, all of which centered on the role of men in single-handedly driving human evolution. From the needs of this Mighty Hunter, supposedly all important human traits emerged: Bipedalism, so men could see great distances and carry weapons; loss of body hair, so men could stay cool while chasing prey; living in caves, so men had a place to come home to. Where, Morgan wondered, were the women? Did they not need bipedalism to carry infants? If lack of body hair protected men from overheating, why did women, who presumably stayed in the cool caves, have even less? What good is a cave to man if he comes home to find “his son’s been dropped on his head and his wife is dead of hypothermia”? In the end, I wish Morgan had turned her attention less to the aquatic apes and spinning her own evolutionary theories and more towards good solid feminist critique of the traditional male bastion of scientific inquiry. At the very least she would have been able to retain her natural wit, something she had to lose in her attempts to earn the respect of the scientific community. But more importantly, I think her astute insights, clear intellectual voice, and cogent writing style would have earned her a solid place in feminist literature and criticism. Instead, she made a choice to wade into deep scientific waters where, in the end, she never gained a firm footing. Read the first chapter of The Descent of Woman on Amazon. I’m sure you’ll see why she captured the imagination of women in 1972. I think Elaine Morgan’s Descent of the Child had the biggest impact on me, for my initial interest in anthro, when I read it in Gr. 8. “It is a great shame the BBC recently indulged this implausible theory as it distracts from the emerging story of human evolution that is both more complex and more interesting. Because at the end of the day science is about evidence, not wishful thinking,” — Professor Alice Roberts and Professor Mark Maslin.